We still remember when our University of Technical Education Ho Chi Minh City (HCMUTE) was in its first years after the independence day of Ho Chi Minh City with very old 'huts', no laboratory rooms and practice equipment for students, our teachers had to manage on their own to make ends meet for living by finding external part–time jobs in addition to their main job of teaching. Today, our campus possesses the very fine scenery whose beauty has been highly praised by foreign visitors and students from outside. The university has been developing into a more and more spacious and sizable one and providing its lecturers with a stable income level of the top universities located in the city area. 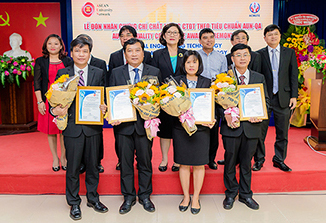 Our university has been awarded the Independence Medal, become one of the first 10 accredited universities in Vietnam, one of the first few universities applying ISO management system. Being recognized for their good quality, our graduated students have a high employment rate with much favor from local and foreign companies. Nevertheless, our greatest achievement is that we have successfully created a solidary and dedicated community in which all the members have been contributing together to HCMUTE's development. Looking back at the stages we have been through so far, we admire and recognize the great work and contribution of Assoc. Prof. Dr. Thai Ba Can, the former President and all other leaders of the previous periods. On behalf of all staff and students of HCMUTE, I would like to express our profound gratitude, best wishes for their health, happiness and hope to continue receiving support, experience and advice from all ex-leaders. The appointment to the position of President of HCMUTE is a great honor for me but also a great responsibility that also weighs on my shoulders. Recognizing the issues and challenges, the intensive competition in higher education worldwide, HCMUTE will move forward to the 2013 - 2018 tenure with the slogan: "Comprehensive, Sustainable Development and International Integration". I am strongly aware of such difficulties and challenges that HCMUTE will face in this new period and I look forward to the collaboration and share from our entire faculty, staff and students. As I stated in my proposal at a key staffs meeting, by the year 2018, HCMUTE will become a national featured university focusing on education, training and scientific research. It will have achieved prestige on a par with other major universities in the country and gradually approach to integration with not only the regionally but also the globally famous universities. 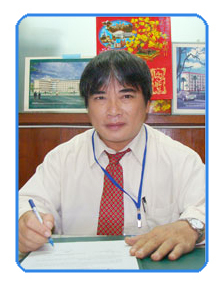 Being currently one of the top 10 universities in Vietnam and also a member in the top group of Southeast Asia universities (basing on standard evaluation index), HCMUTE strives for the award 'Heroic Organization of Labor' and the 1st Class Independence Medal by the 55th Anniversary of HCMUTE’s establishment. It is needed to emphasize once again that these above-mentioned seven programs cannot be achieved without the collaboration of all faculties, staff and students. Finally, I would like to express my sincere thanks to all faculty and staff of our university for having entrusted me for this responsibility. I promise to do my best to make HCMUTE become one of the leading universities in Vietnam and the region. I commit to build the best working environment and remuneration policy for all faculty and staffs so that you all can rest assured to continuously dedicate to HCMUTE’s common cause together. I promise to try to work with the spirit of dedication, high responsibility for not betraying the faith of our leaders, staff, faculty and students of HCMUTE. We will unite in mind and heart to achieve our desired results, try to work in a creative way to take ourselves to a higher level that is commensurate with the background, stature and brand image that the previous generations have painstakingly built over the past 50 years. I would like to send to all of you my warmest wishes for your health, happiness and success.